The Windom Silk Wrap has an exquisite blend of color and sheen. Knit with five hanks of Alpaca Silk, (the Slate combines Alpaca Silk & Metallico) this luxurious piece can be worn as a wrap or a scarf. 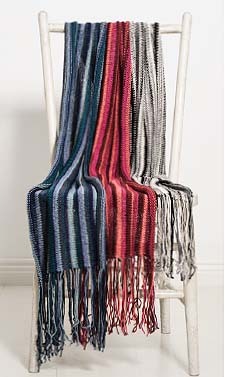 Beautiful drape and stylish stripes, this easy to knit piece is everyday glamour. Materials list at bottom of page. Kit uses 5 skeins (Kits above use tonals in a color range). Use the suggested combos, or put together your own and request the pattern when you checkout!